That sale sold out in minutes, prompting complaints from users who were unable to make purchases due to technical issues. In an attempt to compensate for the technical difficulties, the BitTorrent Foundation completed an airdrop of 5,000 tokens to each user unable to participate in the ICO. Since the token sale, a number of cryptocurrency exchanges have listed BTT for trading. 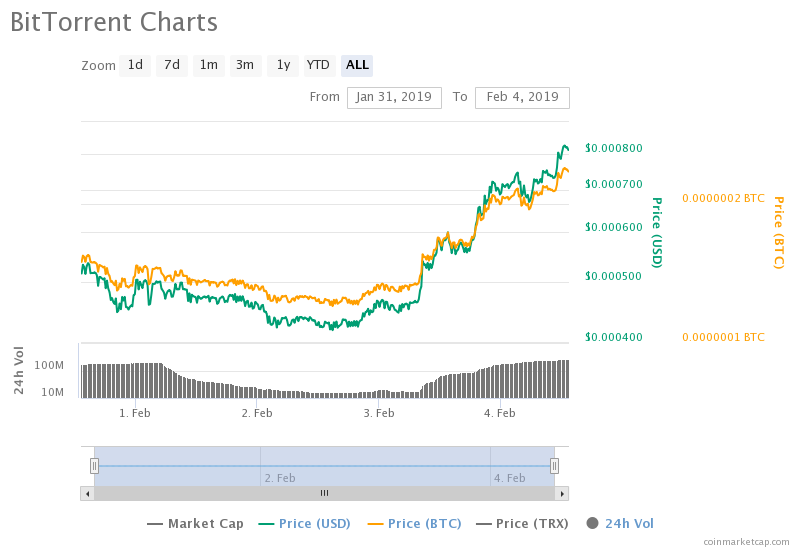 The largest markets for the token thus far are UpBit and Binance, which combined account for more than 90 percent of BTT’s $270 million total trading volume in the past 24 hours. Given the state of the broader cryptocurrency market, BTT’s recent performance is an outlier. The seven-day return for BTT since the ICO accounts for near 600 percent. By contrast, the price of bitcoin reflects a three-percent different from its opening price on Jan. 28, per CoinDesk pricing data.